LOVELY QUALITY LINEN. THE TOWEL HAS NEVER BEEN USED OR WASHED. 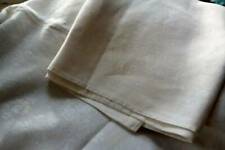 Good sturdy linen -laundered neat and tidy ready to use etc.. World Zone 1 £5.00 World Zone 2 £5.30. This listing is for a French hand woven linen monogrammed tea towel/torchon. There are 4 available. Beautiful tea towels with the monogram G R in red cross stitch. They are unused and ready to use with hanging loops. A fabulous addition to any rustic kitchen. At present they are still quite crisp but will soften and lighten with laundering. They would also make interesting cushion covers. From a non-smoking home. Dispatched with Royal Mail 2nd Class within 3 days from purchase. Ebay will not allow me to alter the additional postage charge if you buy more than one, so if you do so please wait for me to send an invoice. These are a collection of 3 Irish linen white huckaback guest hand towels. 15" x 25", 15" x 21" and 15" x 24" allwith hemstitched top and bottom hems. One towel has hand crochet on one end. These are ball in excellent antique condition with no signs of wear and laundered ready for you to use. Gorgeous vintage Irish linen stripped tea towel. Unused and in very good condition . Some storage marks. Listing will end on Sunday as I will be away from the UK for a month. The towel has a lovely tactile feel to it, the damask being woven with a pattern of large and small shamrock heads. This is a beautiful show towel for the bathroom, yet quite usable and very pleasing. Antique vintage white with red woven checks linen towel or side tablecloth - not sure what it is! Hand embroidery, cutwork and tasselled trim at each end. Measures approximately 100 x 60cms Excellent condition. These are a matching pair of Irish linen white huckaback hand towels w. 22" x 36" with hemstitched top and bottom hems. These are both in excellent antique condition with no signs of wear and laundered ready for you to use. TWO Vintage White Linen Huckaback Towels in Excellent Condition. One Damask with Drawn Thread to each end 22" x 38". One with Green Striped Embroidered ends.21" x 36". Freshly Laundered & in Excellent Condition. Six Vintage French Torchons In linen, each one with the monogram AP. These have never been used and are in excellent condition. They have three red stripes to each side. Measurements 75cm long x 50 cm wide. Here are a pair of vintage linen tea towels, Express Dairy Centenary, 1964, Finchley, designed by J. Christopher Heal. These have been used. There are no rips or tears but colours may have faded, one slightly more than the other, there are a number of marks/stains which I have attempted to show in the photographs. Only washed on low temperature so it is possible that washing with a stain remover or higher temperature could help but I'll leave that to the purchaser. I've included free UK postage on this listing. They are from 1930s and presented in an old white colour. VINTAGE LINEN - A Set of Three White Hackaback Guest Towels Fringed. 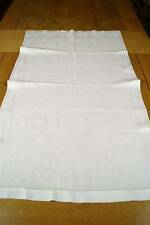 40" x 20"
White Hackaback Guest Towels. Fringed at Both Ends. A Set of Three. For example: Boxed, Original Wrapping or Embroidery Transfer. In Very Good, Clean Condition. Clean and Freshly Laundered, unless stated otherwise. All pure linen, made in Ireland, designed by Fragonard for The National Trust. 2 x Vintage Linen Glass Cloth Tea Towels 34" x 23"
BUY 1, GET 1 at 50% OFF ON ALL TEA TOWELS. 34" x 23" Approx. Slight wear on one edge. All faults will be listed. Mistakes do happen and we will do our best to resolve them quickly. May have storage marks. Good condition. They are slightly different sizes: 24 x 17 and 23 x 16 1/2 inches. Quality linen cloths with a lovely bright yellow stripe. Irish linen and a large 74cm x 56cm in size. These have been stored away in a drawer but are unused. Dispatched with Royal Mail 2nd Class. Large Vintage Irish Linen Red Stripe Tea Towel Cloth 32" x 25"
BUY 1, GET 1 at 50% OFF ON ALL TEA TOWELS. 32" x 25" Approx. All faults will be listed. Mistakes do happen and we will do our best to resolve them quickly. Antique white Irish linen damask towel with crochet lace trim & monogram "B"
Clean and ready for use. Many, if not all, linens will also have a laundry mark - either in indelible ink or embroidery onto an edge or a corner. it may not be available for long! These are a matching pair of Irish linen white huckaback guest hand towels with poppies in the design. 13.5" x 20.5" with hemstitched top and bottom hems. These are both in excellent antique condition with no signs of wear and laundered ready for you to use. 2 Similar Vintage White Irish Linen Guest Towels with Hand Crochet Trims. 2 Vintage White Irish Linen Guest Towels with hand crochet trims at both ends and the monogram on one corner. The size of each guest towel is 23 1/2 in ( 60 cm ) wide x 44 in ( 112 cm ) long. They are the same damask pattern of Cherries and Cherry blossom and they both have the same monogram which could be a "J" or a "T" but the hand crochet trim which is on both ends of each towel is not quite the same. They are good quality linen in good condition. Dispatched with Royal Mail 2nd Class. A pair of unused antique huckaback linen towels with a striped pattern. As the linen still has its creamy glaze the towels will need washing before use. Size approx 22” x 30”. Lovely set of 6 French unused striped linen tea towels length 28" x 23 3/4". Two Good Vintage Linen Damask Huckaback Towels Crocheted Ends, about 20"x 40"
Here are two linen huckaback towels from about the 1930's in excellent condition. PAIR OF MATCHING UNUSED LINEN TEA TOWELS. A pack of three French linen tea towels in their original packaging never used. These tea towels are wonderful to use they soften with age. They measure 68 cms x 21.5 cms Please refer to the photos for general condition. I have another three in another listing. Please take a look at my other items. This is a beautiful early 1900's damask crochet edge towel. Collections in Person ♥ . Would be ideal to make fabulous cushion covers, small blinds or simply used as tea towels in a shabby chic kitchen. Calender years are 1968, 1969, and 1970. As new have never been laundered. nbsp;font>. There are four, larger towels. Two, smaller, white hand towels. All linen, or cotton. Three have lace, one has fringes. These have lace at one end only. All with trim at both ends. I don't think these are as old as the others. Large Vintage Linen Pantry Glass Cloth Tea Towel 32" x 24"
BUY 1, GET 1 at 50% OFF ON ALL TEA TOWELS. 32" x 24" Approx. All faults will be listed. Mistakes do happen and we will do our best to resolve them quickly. May have storage marks. 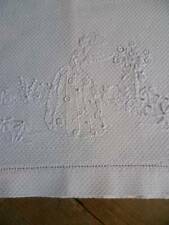 New listingA VERY PRETTY LINEN DAMASK GUEST TOWEL WITH TASSELS 34" X 20"
Lovely quality Irish linen tea towels embroidered with Lily of the Valley. Label reads - All pure Linen / Made in Ireland. Hand embroidered monogram to the corner. A few marks and a largeish stain to the top section see photos. Hanging loop to one end. THIS IS A HUCKABACK TOWEL WITH PINK, PURPLE & BLUE NEEDLEWORK EDGING. IN GOOD CONDITION WITH NO TEARS OR STAINING. Hand embroidered monogram to the corner. White Cotton Damask with grapevine relief. Strong sturdy dishcloths will soften with age. traditional red yellow & blue stripes tea towels. 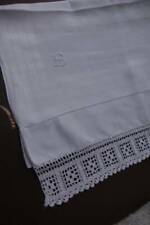 3 Assorted Vintage White Irish Linen Guest Towels. 3 Assorted Vintage White Irish Linen Guest Towels. The bottom one in the photograph is 19 in ( 48 cm ) wide x 39 in ( 99 cm ) long and it does have a hand crochet trim on both ends and it is in good condition. The other guest towel with a hand crochet trim on both ends is 23 in ( 59 cm ) wide x 42 in ( 107 cm ) long. As you can see the hand crochet lace is a little grey but other wise it is in good condition. The scalloped edge guest towel is machine embroidered on one end and the size is 21 in ( 53 cm ) wide x 41 in ( 104 cm ) long. This one has a small fault in the center of the embroidered pattern as shown in the last photograph but other wise it is in good condition. Dispatched with Royal Mail 2nd Class. Lovely old French dishcloths with hand embroidered CR. pre owned French table linen. beautiful hand woven cotton & linen. 31"/78 cm long x 23.5 "/60 cm. BUY 1, GET 1 at 50% OFF ON ALL TEA TOWELS. I am unsure if these are Linen as they aren't marked. One Tea towel has a shiny, almost waxy look to it. 30" x 22" Approx. All faults will be listed. Mistakes do happen and we will do our best to resolve them quickly.